ALL eyes have been on the battle for the National Hunt trainer’s title in recent days, but just over a week ago two Carlow racing men created their own bit of history when horse breeder Martin Byrne and trainer Willie Murphy enjoyed an unforgettable day at the Tattersalls Ireland Cheltenham Sales. Byrne’s horse Global Citizen was sold for over €320,000 and the five-year-old is now in training with Jonjo O’Neill at the renowned Jackdaw’s Castle yard. Yes. Last week was as dramatic a week as there has been in Irish racing. Yet while Willie Mullins and company continue to ply their wares in the full glare of the media spotlight, Byrne and O’Brien go about their business with the same zeal and application as any of the big name players. The aforementioned Global Citizen, out of Alkaadheem and Lady Willmurt, was a real eye-catcher from the moment she stepped into this world. “From very early on I knew he was special. He is a lovely-looking horse. 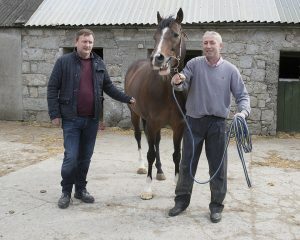 There was something different about him,” Rathoe trainer Willie Murphy told The Nationalist last week. 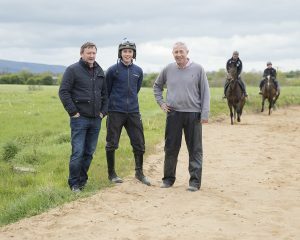 By winning the recent Bellurgan Park point to point, just outside Dundalk, the five-year-old was vindicating the faith his trainer had in the horse. Byrne, who got into the game 15 years ago as a member of a number of syndicates, said the trainer had Global Citizen “spot on” for that point to point success. As a result, the value of the horse increased. Global Citizen is not the first good one to come out of Alkaadheem. A Hare Breath is with Ben Pauling and has won twice under rules. In addition, De Plotting Shed out of Beneficial and Lady Willmurt is trained by Gordon Elliott and was fourth in the Stayers Hurdle in Punchestown last week. The stallion, Alkaadheem, is owned by Willie Murphy while Martin Byrne owns Lady Willmurt, the mother of Global Citizen. After a sale it is normal for the breeder to pass on some of the profits to the trainer. Murphy and Byrne have a good relationship. “It is at his discretion. Martin has been very loyal. The yard makes its money from the generosity of the breeder. He is here for years and is like part of the family,” says Willie. There is also a knock-on effect for those who work with the horses. “It lifts everyone’s morale,” says Willie, while Martin loves the unpredictability of it all. “It is the fun of breeding. Even seeing them going on training is fantastic,” enthuses Byrne. Unlike the breeder, Willie Murphy was born into the game. His father and generations before him were all involved with horses. A number of years ago, he had the leading point-to-point horse, Burnt Oil Babe, but his yard mainly breeds horses to train and then sell them on. Murphy recalls he had done well out of one sale in particular when he sold one from the yard for €7,000. That horse went on to realise €80,000 before going even further when it was sold for €320,000. Then along comes this five-year-old gelding. The sale of Global Citizen is huge for Murphy. The Bellurgan success confirmed their initial feelings about the horse. “He was a valuable commodity at that stage. “Even before the sales there was a lot of interest. From the time he won it provoked a lot of interest in him. The key people wanted him. A lot of the big English and Irish guys wanted him from an early stage. Yet Global Citizen’s dam was not exactly a record breaker herself. Byrne came across Lady Willmurt with the late Eddie Carter from Busherstown through Goffs. Her best was a second in a beginner’s chase with Jessica Harrington but when she injured her leg all hopes of her going racing were shelved. Instead, she was put into foal. That decision was a good one. Since Global Citizen was sold, the trainer’s phone hasn’t stopped ringing. There has been several enquiries about Alkaadhem and Willie says the sale has brought the yard “to a wider audience”. Annacotty, who went on to win a Grade 1 race, is probably the best known of the Rathoe exports but the Tattersales sale has given the yard a bigger profile. Morale is sky high over in Rathoe and Murphy says the staff deserve as much credit as anybody for the sale. “Without them we would not have been in Cheltenham. My brother Jim, Shane Prendergast, Mark Farrell, Pat Doyle the main yardman, PJ Kennedy, Moira McElligott. Things are never wrapped up. There are always things to do. Without those we would not have had a sales topper,” says Murphy.